Sa bhliain 1921, tar éis Chogadh na Saoirse, shínigh ionadaithe na Chéad Dála agus rialtas na Breataine an conradh síochána ar a dtugtar an Conradh Angla-Éireannach. B'é an conradh seo a chuir an chríochdheighilt i bhfeidhm ar Éirinn. Roinneadh oileán na hÉireann ina dhá stát, mar atá, Saorstát Éireann, a bheadh ina Tiarnas cosúil le Ceanada, leis an Astráil agus leis an Nua-Shéalainn, agus Tuaisceart Éireann, a bhí le fanacht laistigh den Ríocht Aontaithe. Idir sin agus an lá inniu, gaireadh Poblacht den tSaorstát go hoifigiúil, agus Tuaisceart Éireann fágtha sa Ríocht Aontaithe. Bhí Éire le fanacht laistigh de Chomhlathas na Breataine, agus bhí trí chalafort le fanacht in úsáid na Breataine, Baile Chaisleáin Bhéara, an Cóbh agus Loch Súilí. D'fhan Calafoirt an Chonartha seo faoi smacht na Breataine go dtí an bhliain 1938. Síníodh an conradh ar an 6 Nollaig 1921 agus tháinig sé i bhfeidhm bliain amháin níos déanaí ar an 6 Nollaig 1922. 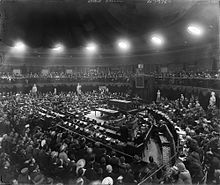 Dhaingnigh an Conradh sa Dáil ar an 7 Eanáir 1922. Tar éis an toraidh, shiúil Éamon de Valéra agus a leathbhádóirí, a labhair i gcoinne an Chonartha, amach as an seomra. Dhá lá ina dhiaidh sin, ar 9 Eanáir 1922, sheas Eamon de Valera síos mar Uachtarán. Toghadh Art Ó Gríofa ina Uachtarán nua ar an Dáil. I ndiaidh an tsínithe, ní raibh na hÉireannaigh ar aon tuairim faoin gConradh. Tamaill ina dhiaidh, bhris Cogadh Cathartha amach idir lucht a thacaithe agus iad siúd a chuir ina choinne. Liam Lynch agus an "Army Convention" Mansion House, BÁC 9 Aibreán 1922. Dá mbeadh an Conradh agus dlí na hÉireann ag teacht salach ar a chéile, bheadh tús áite ag an gConradh. Winston Churchill, Státrúnaí na gCoilíneachtaí. Gordon Hewart, Ard-Aighne Shasana agus na Breataine Bige. Art Ó Gríofa (cathaoirleach toscaireachta), Aire Gnóthaí Eachtracha. Mícheál Ó Coileáin, Aire Airgeadais. Tugadh an leathanach seo cothrom le dáta an 9 Eanáir 2018 ag 00:15.